After the last few weeks of salty meatiness, when SodiumGirl asked me to develop a salt free recipe I thought it would be good for many reasons. 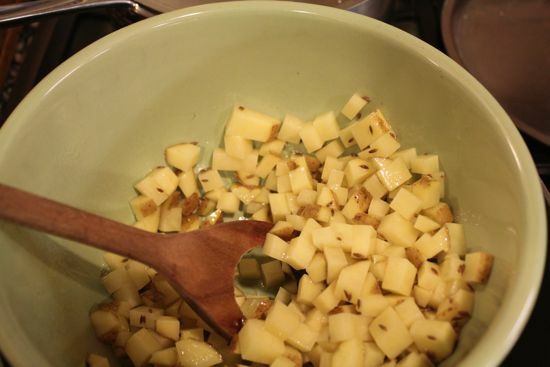 In a large bowl, add the broccoli and potatoes, the oil and the cumin seed. Mix well. Place the broccoli and potatoes on a sheet pan lined with parchment and roast for 20-25 minutes, until beginning to crisp around the edges. In the meantime, in a large skillet, heat 1 T oil. Saute the onion and garlic until translucent. Add the ginger and spices and continue to cook for 2-3 minutes. 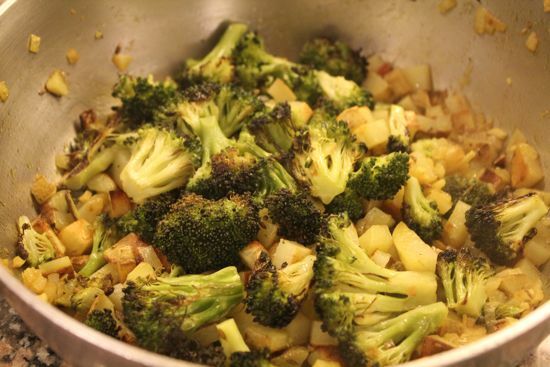 Add the broccoli and potatoes, stir well to coat with the spices. Add water and cook quickly, until the water has evaporated. Serve with a spritz of lemon juice, to the people you love most. Because keeping their heart healthy is a great way to show your love. Heat oil in 4 qt saucepan or saucepot with cover. Saute 1 c onion and 1 garlic clove until golden brown. Remove from pan and set aside. Add to the pot water, lentils, 1 c onion, 1 garlic clove, spices. Bring to a boil. Reduce heat and cover and simmer until tender, about 25 minutes. Add minced jalapeno to taste. Taste and correct for salt. Cook 10 additional minutes. Remove 1/2 the lentils and blend in the blender (or do as I do and just blitz the whole pan a few times with the immersion blender). Stir in the browned onion and garlic. Top with chopped cilantro. 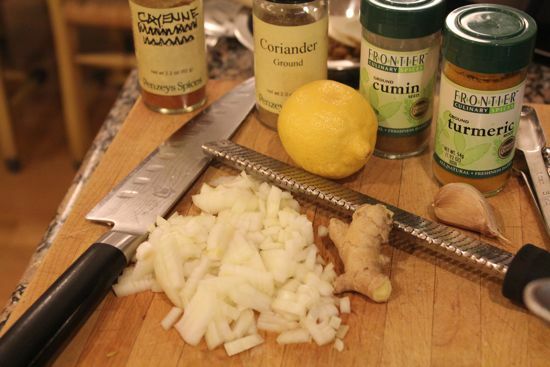 Cathy, love this recipe–and am passing along to my brother who has hyper-tension. I know and belive that there are ways to lower blood pressure and high cholesterol without drugs, and still eat well. This reciep is more proof! Cathy – this is amazing! I am so honored to have had you participate in this rally and I am blown away by the results. It is amazing how many of us have been touched by heart disease and you are a prime model for how to stay healthy with a few culinary tricks in the kitchen. Thank you again for getting all dal’ed up for me and the Love Your Heart Recipe Rally! I hope to do this again sometime soon! Been craving some good clean recipes lately and here I ready for Vegas and Burger Bar and Bouchon! There’s next week, these recipes look great. I made the broccoli and potatoes tonight for dinner. It was delicious, full of flavor! I served it with an Indian butter chicken and it was a great meal. I can see that dish becoming a regular one in our house! 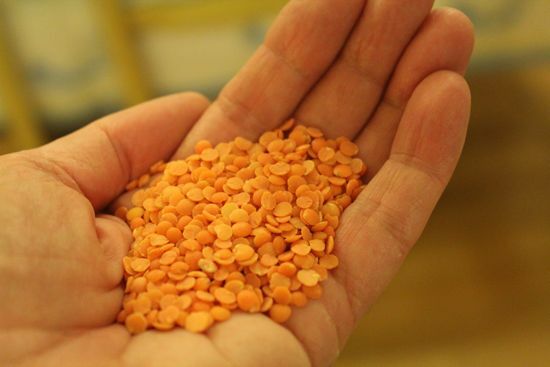 I look forward to trying the lentils another time! Please let me know how many servings this recipe makes. Dennis and I can eat most of the broccoli dish ourselves. Maybe a little leftover for lunch the next day. poblano rajas, potato and egg.